Baseball is one of my favorite sports to play and watch. Naturally, the All Star game is a must for me. I was privilege to attend the one at the Old Yankee Stadium in 2008 and had fun. Baseball is America's pastime. It is the game that has helped Americans direct their focus from daily stresses and national tragedies. However, this year's All Star game was tarnished. Puerto Rican singer Marc Anthony, a New Yorker or "NuyoRican" was invited to give his interpretation of "God Bless America." This hymn is sung during the 7th inning stretch in many baseball stadiums. It is a song that calls on the Creator who grants us inalienable rights and has allowed our nation to prosper to continue blessing the nation. However, some ignorant trolls took to Twitter and began tweeting racist tweets against Marc Anthony. Derogatory terms were directed at him as well as Mexicans. 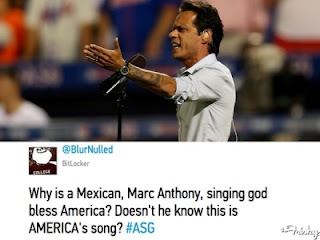 These people gave away their ignorance not only because of the racism, but for the mere fact that they believed Marc Anthony to be of Mexican descent. Marc Anthony is American born of Puerto Rican descent. Not only is he American by birth, but also for the mere fact that Puerto Ricans are already citizens because Puerto Rico is a commonwealth of the United States of America. Whether born in the States or on the island, Puerto Ricans enjoy American citizenship and are proud of that, even though other Hispanics often mock Puerto Ricans for not having "independence." However, this is most likely due to envy because many non-Puerto Rican Hispanics risk their lives to come to this nation yet have the nerve to mock Puerto Ricans for having citizenship. Moreover, the angry tweets criticized that the hymn "God Bless America" was sung by a non-America (according to them). However, this once again shows their ignorance. The composer of this hymn was Irving Berlin, an immigrant born in Russia of Jewish descent. The irony right? In closing, it is sad to learn that these things still happen in American society in the 21st century. We need to work more to educate our young people so that they will not grow up with misconceptions and prejudices against any group. I invite all to file a report to Twitter against these racists who use the site to abuse others. I will write on this at a later time.